Real–world analogies make the material understandable, with a wide variety of well-documented examples to illustrate each concept. Along the way, you’ll develop short programs through a series of coding challenges that reinforce the content of the chapters. 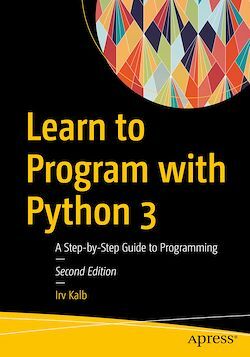 Learn to Program with Python 3 guides you with material developed in the author's university computer science courses. The author's conversational style feels like you're working with a personal tutor. All material is thoughtfully laid out, each lesson building on previous ones. This book assumes no prior programming experience, and would be appropriate as text for a high school or college introduction to computer science.